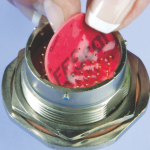 To be instrumental to our customers’ success by delivering top quality EESeal® connector inserts for high value electronics with EMI and/or transient protection issues. Provide solutions that are fast, effective and supply high value to our customers. Quell Corporation designs and manufacturers EMI/RFI and transient protection solutions specific to our customer’s applications and products. At our headquarters in Albuquerque, NM, Quell has the engineering horsepower and manufacturing expertise to deliver customized EESeals® quickly and cost-effectively. Many of our customers have just failed EMI testing and are under tremendous pressure to find a solution NOW. Going through purchasing and waiting weeks or months is simply not an option. We get it. At Quell, we routinely design, build and ship custom prototypes overnight the same day they are requested for FREE! That’s right – zero hassle, zero cost, and you can prove your EESeal® solution the very next day. EESeals® are a proven production solution. Through our 20 years of operations, we have shipped over 1 million EESeals® into around 14,000 demanding HiRel, applications worldwide. 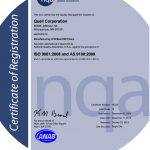 Quell is well positioned to serve its customers around the world with products that are available direct from the factory or through a network of independent manufacturers’ representatives. Please contact us or one of manufacturers’ representatives to discuss your requirements.